Difference between revisions of "Paranoia Text Encryption for PC"
Keep your notes, messages (emails, chat posts, social networking posts, SMS, ...), cryptocurrency keys (seeds, mnemonics), and other texts safe from all unwanted readers. 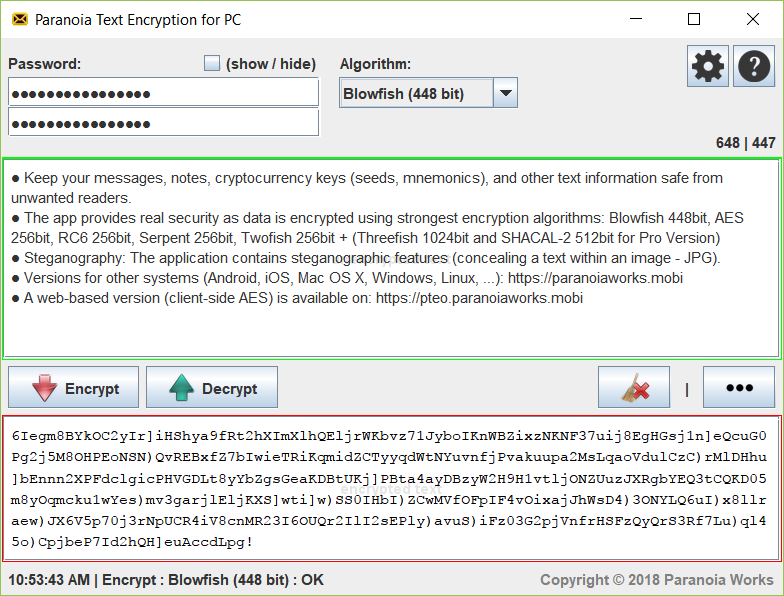 Texts are encrypted using strong encryption algorithms: AES (Rijndael) 256bits, RC6 256bit, Serpent 256bit, Blowfish 448bit, Twofish 256bit, GOST 256bit + (Threefish 1024bit and SHACAL-2 512bit for Pro Version) ciphers are available. A steganography implementation is included (concealing a text within an image - JPG). A steganographic algorithm (F5 algorithm) is used in combination with chosen symmetric cipher algorithm to make a final steganogram (JPEG image). This page was last modified on 24 March 2019, at 17:06.